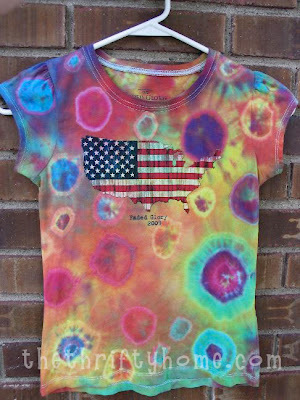 Every summer I tie-dye shirts with my kids. It has become a fun tradition that they look forward to and love. I keep a look-out all year long for 100% white cotton shirts on clearance. I had a shirt for my son that I only paid $1 for and I also had a shirt for my daughter, but she needed it for a school dance earlier this year. So I went to WalMart and found flag shirts for $3 and bought one for my daughter and 1 for my 2 yr. old. I bought a tie-die kit at Joann's on sale and then the fun began. My daughter wanted tie-dye circles all over her shirt, so we put elastics all over it. 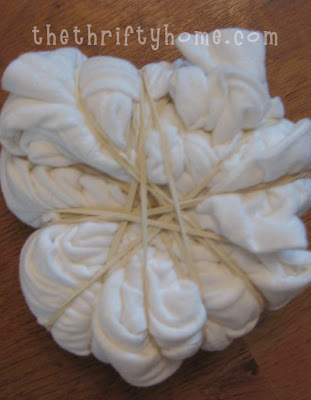 We just took small, medium, and large sections of the shirt and put the elastics tightly around. For some of the bigger bunches we used 2 or 3 elastics for a circle inside a circle effect. My daughter (8 yrs.) completely saturated her shirt, letting all of the colors run together. The kit only had the primary colors (red, yellow, and blue) so we were not in too much danger of her shirt looking like a muddy mess. I tried to encourage her to go with a red, white, and blue theme, but she wanted every color and had her own ideas. 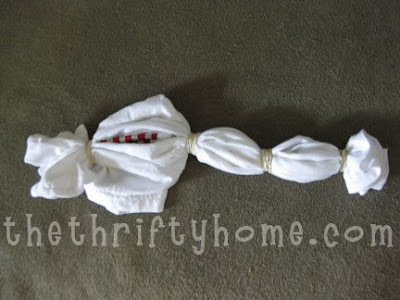 I put the shirts in Ziploc bags for about 7 hours, then I cut off the elastics and washed in the washing machine. I think her shirt turned out pretty neat and colorful. An original one of a kind shirt! My son (11 yrs.) wanted a swirl effect. 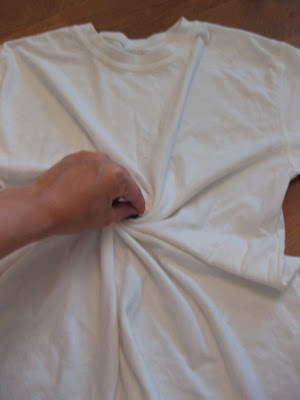 We pinched the middle of the shirt and wrapped it up with elastics. He saturated his with blue and red dye only, because his favorite color is purple. He was very happy with his results and loves wearing his shirt. I got to do my 2 yr. old sons shirt and went with stripes. 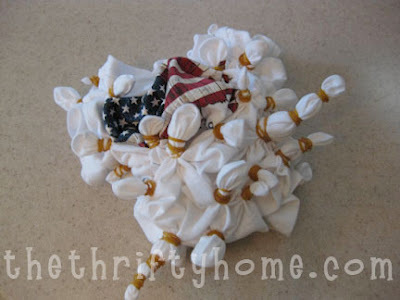 I scrunched up the shirt and put elastics on it leaving the flag part in it's own space. Blue was the only color left after my daughter finished with her masterpiece, so blue stripes is what I ended up doing. I think it turned out pretty neat. Note: When I washed the shirt, the white stripes turned a light blue. Total amount that I spent including the shirts was $13. 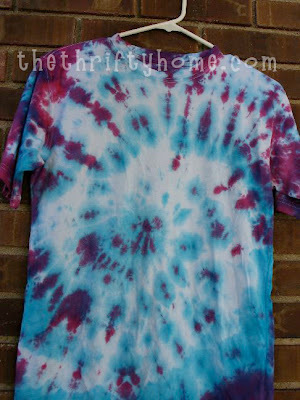 If you try to tie-dye, make sure you get 100% cotton. Joann's and Michaels sells t-shirts right next to their tie-dye kits, but they are only 50% cotton. I made the mistake of using them a couple of years ago and they don't turn out as vibrant. Also, the box says that it will dye up to 8 shirts, but it really only does 4 if your kids are as heavy on the dye as mine were. 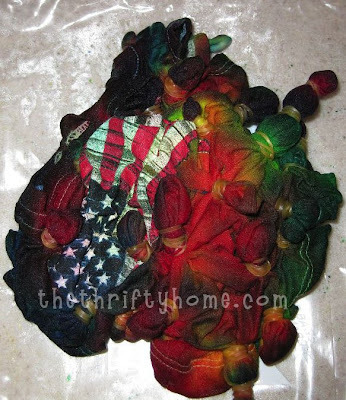 I love to see the different tie-dye effects that people come up with, so if you do any tie-dying this summer, please send me a link. I would love to post it here. Visit Hooked on Houses to see what everyone else is "hooked on" this week. Also visit The Inspired Room for her link party. I remember my mom doing this w/my brother, sister and me when we were kids b/c I saw some other kid at school w/a tie dyed shirt and I just had to have one. It was so much fun! I have not ty-dyed in such a long time! I really want to again after looking at this! All 3 shirts turned out so neat! 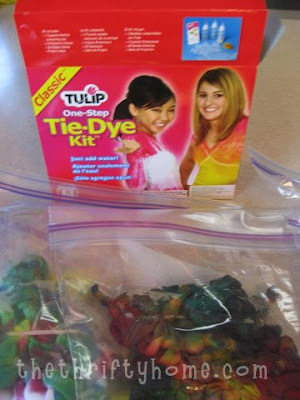 I haven't tie-dyed in YEARS! My kids would LOVE it! I might just have to give her a try! Thanks for sharing! AND... I'm glad you attached pics of the rubberbanding.... i would be clueless! THANKS! Your shirts turned out so well. And each one is so different! 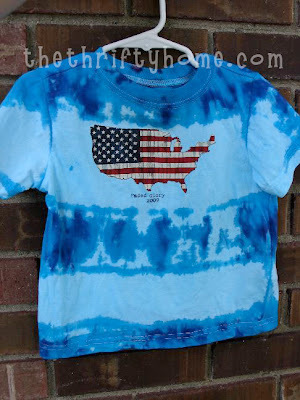 Love the use of the flag shirt......great idea! I soak my shirt in cold salt water after dying to set the colors, then tumble dry. Never tried this, but sounds a great activity to do with the kids. You should see some of the shirts my kids have designed over the years. And then they wore them...yikes. You can be proud of your children in these. We should try this. We almost always used fabric paint. I had a Shrek birthday party for my daughter a few years back and that was the favor a do it yourself tye die shirt in green of course. The kids had a blast and it was an activity and favor all in one! I love this post so much! My niece is staying with me for a month this summer and she will love this project... My granddaughter also lives with me... so we will all have fun.. thank you so much for the great idea! Have a wonderful week end and a fabulous 4th! Hello Jen - what a fabulous idea! I love how they all turned out. Thank you for sharing. BTW Have you finished your first quilt? ?